You have an opportunity to patrol alongside APD without leaving your computer. Officer Fred Duran will take our community on a virtual ride along as he patrols the Southeast Area Command. 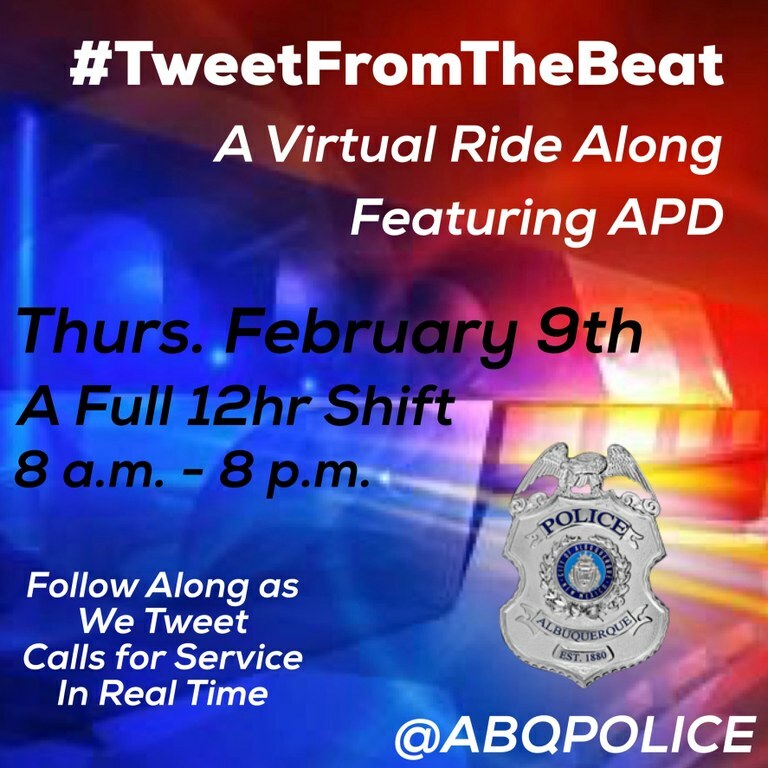 TIME: 8 a.m – 8 p.m.
During Tweet from the Beat, we hope to give the community an inside look at police work. Officer Duran will have a partner who documents the calls they take during that shift through a series of Tweets. This is an opportunity to see what types of calls APD responds to in real-time, and how they handle those calls for service. 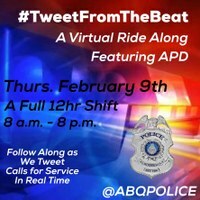 The duo will post photos and video during the #TweetFromTheBeat and for the first time ever, demonstrate to the community what it is like to patrol on the Department’s new 12-hour shifts. #TweetFromTheBeat also allows residents to go on a ride along without ever leaving the comforts of home. If you don’t follow us on Twitter @ABQPOLICE, our Twitter feed is always available on the Department’s homepage at www.cabq.gov/police. This allows non-Twitter users to be a part of the action without having to sign up for the social media service.